Applewoods Estate Pvt Ltd, Shantipura Cross Roads, Sardar Patel Ring Road, Ahmedabad - 380058, Gujrat, India. Applewoods Estate Pvt. Ltd. goes beyond constructing just homes, it builds dreamscapes for satisfied living and brighter futures. We create aspiration worthy spaces by bringing harmony between beauty and utility, tradition and contemporary, technology and nature. 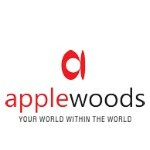 The highly regarded corporate giant, Sandesh Group, promotes Applewoods Estate Pvt. Ltd. By ushering change with its presence across the media spectrum, Sandesh Group’s 90 year tradition is unparalleled. It stands as a testimony to our credibility and high standards. Detail-oriented, finesse obsessed and skilled architects, engineers, planners and designers make our team and they strive to constantly deliver better and raise the bar.